Traveling through Asia in April is a mixed bag of fun festivals and mostly changing seasons. In Southeast Asia, April is a transition month. Oppressively hot days eventually succumb to afternoon showers that build into the rainy season as the Southwest Monsoon approaches. Meanwhile, countries such as Indonesia that were experiencing rain will begin to slowly dry out as they hand the rain to the north. The tourist crowds will trickle south toward Bali for better weather. Although April is pretty well considered the last dry month in places such as Thailand, the heat is at its peak for the year. Dust and ash fill the air after so many consecutively dry months. By April, local residents are pretty well ready for the rain to begin. On the other hand, Beijing and other destinations in East Asia can be comfortably enjoying spring weather. Festivals celebrating the changing of the seasons abound throughout Asia. April marks the real start of spring in East Asian countries such as China, Japan, and Korea; flowers will soak up the plentiful April showers and begin blooming. 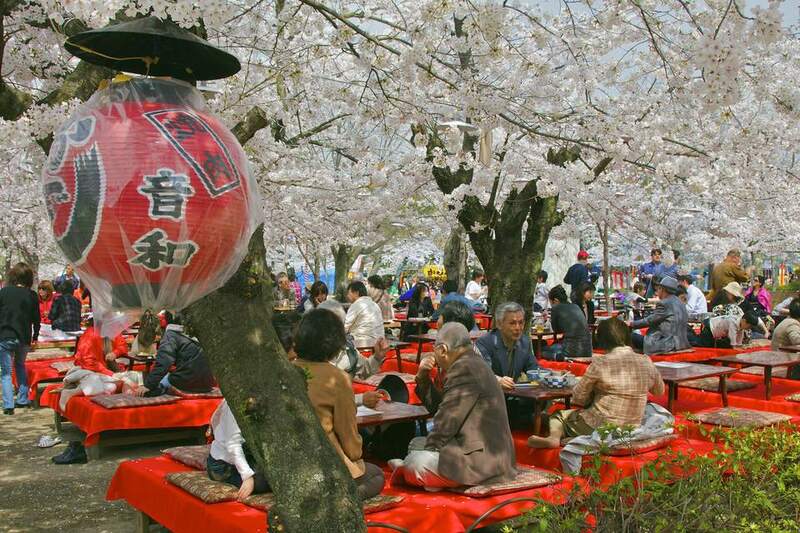 In Japan, parks will fill with flower admirers for hanami. April is the last month to enjoy decent weather in Hong Kong and many other popular destinations before temperatures and rainfall increase dramatically. The humidity can become a real nuisance. These large events will certainly affect travel in some places as hotels and transportation book up. Don't get caught unaware; time your trip carefully to be in each place a few days early to enjoy the festivities. Songkran in Thailand: Celebrated annually from April 13-15, the traditional Thai New Year is definitely the biggest water fight in the world! For at least three days, both locals and tourists alike will fill the streets for splashing, dancing, and good-natured water fighting. The epicenter for Songkran is in Chiang Mai, however, the festival is celebrated across Thailand and even in Luang Prabang, Laos. Warning: you will get wet at this festival! Reunification Day in Vietnam: April 30 marks the celebration of Vietnam's reunification of north and south following the Vietnam War. Temporary stages are constructed for performances in the streets of Hanoi and Ho Chi Minh City. Flag waving and patriotic propaganda are abundant. Reunification Day is an interesting time to be in Vietnam's big cities, however, some attractions may be closed or extremely busy. Hanami in Japan: April is the peak month for viewing the newly blooming cherry and plum blossoms throughout Japan. The beautiful blooms begin to appear from south to north as the weather warms. Japanese friends, couples, families, and coworkers gather in parks for picnics and parties to enjoy the blooms with the help of good food and a little sake. Golden Week in Japan: Four public holidays hit Japan from April 29 to May 5: Showa Day, Constitution Memorial Day, Greenery Day, and Children's Day. As businesses close for the holidays, many Japanese take advantage and travel during Golden Week, making it the busiest time of year in Japan. Transportation will be bogged down until at least May 6, and attractions will be packed—plan accordingly! Nyepi: The Balinese Day of Silence, Nyepi, sometimes hits in April. The occasion is based on a Hindu lunisolar calendar; dates change annually. During Nyepi, the airport closes, all transportation shuts down, and visitors are expected to remain inside their hotels for 24 hours. Tourists aren't exempt! But don't worry—the night before Nyepi, considered a New Year's Eve, is one big party. The weather is in steady transition throughout Asia in April. The first hints of the Southwest Monsoon arriving will begin to show as rainfall increases throughout much of Southeast Asia. For the most part, April marks the winding down of the busy season in Thailand, Vietnam, Laos, Cambodia, and northern parts of Southeast Asia. You may not notice: Thailand is such a popular destination that it's busy practically all year long, regardless of the season! Southeast Asian countries farther south such as Indonesia will just be gearing up to get even busier. April is one of the best months to enjoy Bali before the summer crowds surge. Australians grab cheap flights to Bali just as winter is beginning to take hold in the Southern Hemisphere. Spring will be building through much of China, Korea, and Japan with temperatures climbing to comfortable highs during the days but dipping back down for cool evenings. Most places in India will be very hot and dry. Spring showers will turn East Asia nice and green after a long winter. The fruit trees — particularly cherry and plum trees — will be blooming, making parks and public areas increasingly beautiful and busier. April and May are good months for doing some trekking in Nepal before rain, snow, and summer humidity arrive to obstruct views. April is a good compromise between pleasant weather and fewer people on the trail. Some trails get very busy in May with Everest climbing season in full swing. Smoke and haze from illegal fires burning out of control in Northern Thailand, Laos, and Burma can cause air quality to become extremely poor in the area. Popular tourist destinations such as Pai are affected. In years past, particulate matter has reached dangerous levels. Sometimes the airport in Chiang Mai has to be closed due to low visibility. The large particles in the air are very unhealthy. Sometimes plastic rubbish is burned at the same time, adding additional toxicity. Conditions improve quickly once monsoon rains begin; however, travelers with respiratory problems should be aware of particulate levels before planning a trip to the area.